On to part two of our first date night sans Harry! You can see the first part of our night here. After dinner at Tapas Valencia we headed to Hammond, Indiana. There isn't much in Hammond except the Horseshoe Casino, which is where we were going for the night. For our first anniversary Ant got us tickets to the Kelly Clarkson concert at the casino's concert venue. We got to the concert just as the opening act, Matt Nathanson, took the stage. I didn't think I was familiar with him, but I recognized a few of his songs. We enjoyed Matt's set while drinking a couple of beers. Not only did he sound good, but he had the whole crowd laughing a few times, too. I was soooooo excited to see Kelly in concert. She is my favorite singer and this was my third concert of hers; I saw her in 2005 in Kansas City and 2009 in Bridgeview, Illinois (for the B96 Summer Bash). Ant was a Kelly virgin though. At Saturday's concert she played a lot of her new stuff, which I'm not as familiar with, but she sounded great. We also got to hear most of her big hits and a couple of covers. 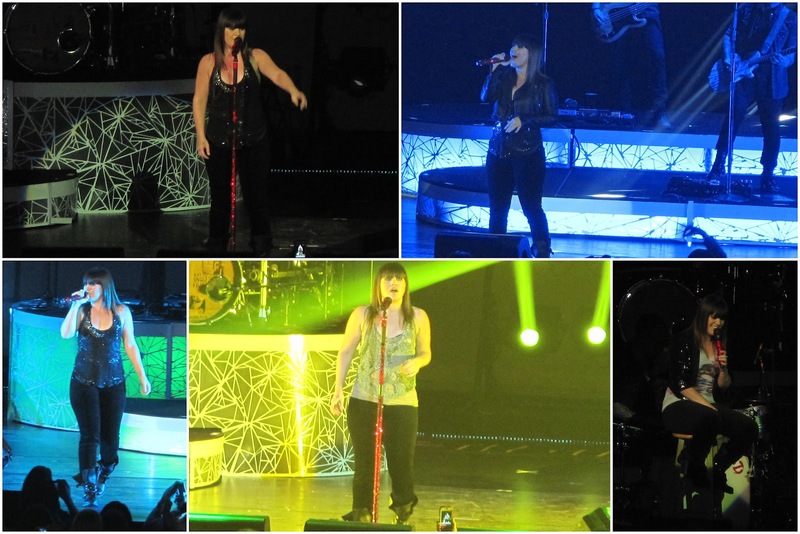 Here's a bunch of pix from the concert. After the show we headed to the casino floor. We wanted to hang around a bit to avoid traffic. I'd only been to one other casino before (the Hollywood Casino in Aurora, Illinois), and it was the most depressing sight I'd ever seen. Fortunately the Horseshoe wasn't quite as depressing since a large percentage of the patrons were under 50 and not carrying around oxygen tanks. I'd never actually played a casino game before, and wasn't really planning to. But, we found this game called Big Six and thought it looked fun. I put $5 down and lucky me, I doubled my money! I could barely contain my excitement when I cashed my chips in, the cashier must have thought I was totally off my rocker! My high rollin' husband put down $20 and walked away with $55 in chips. Not too shabby. The dealer yelled at me right after I took this picture, so I didn't take any more in the casino. Oops! After Big Six I put $1 in the penny slots but didn't win anything. After an hour in the casino we were ready to head home. Apparently everyone else had the same idea and it took us over a half hour to get out of the parking garage. We got back to my dad's about 1:00 a.m. and picked Harry up without incident. All in all it was a fun evening, but I missed my baby so much! It was nice going out for once and not having to think about bottles and diaper changes, but I wouldn't be surprised if we wait another four months before we do it again. We saw Matt Nathanson open for John Mayer way back in the dizzay...like 2001 or 2002 I think. We thought he was great too! :) Oh, and as for casinos, we love those too. There's a massive one about an hour away called Foxwoods/MGM Grand (in CT). http://www.travelers411.com/forums/picture.php?albumid=253&pictureid=2135 Wish I knew how to shorten links...anyway. I think it's the biggest in the U.S. and 3rd biggest in the world. My favorite thing to do there is play Bingo but they have tons of restaurants, shops, slots, table games, an arcade, a movie theater, two concert halls, night clubs, bars, multiple hotels etc. Bingo at Foxwoods is not your grandmother's church basement Bingo either...it's in a ginormous room with big screen TV's showing the numbers and huge jackpot prizes. http://www.hartfordbusiness.com/lib/download.php?uuid=0001-41732e7a-4e0ceb96-d6f7-5d34a9db&credit=auto&bottom=desc&tsize=344 Love it!! Now I wanna go! :P Holy long comment, huh?